Children are collectors by nature. Exploring, finding, and sorting objects is beneficial for growth and development – and it’s fun! Birding is a great way to tap into your child’s inner explorer. Adults and children, alike, can find great joy in keeping track of spotted birds. Birds come in all different sizes and colors. Their behaviors differ and their songs are unique. Birding is especially fun because it can be done anywhere! Use the tips below to make the most of your time among our feathered friends! Binoculars – Real binoculars are perfect for seeing a bird up close, but might be difficult for little ones. Toilet paper tube binoculars are a wonderful introduction! They do not magnify, but they help little eyes focus on a smaller area. Notebook – Adults can help beginning birders keep a log of birds! Imagine your little one growing up and having pages and pages of bird spottings. It’s the perfect way to collect! You can bring paper and pencil, or keep notes on your phone. The Young Birder’s Guide to North America – This photographic guide contains a checklist, birding tips, and tidbits on why birding is cool! National Audubon Society First Field Guide: Birds – The National Audubon Society was formed to protect birds and their homes. This mini guide helps children learn what makes a bird a bird and shares amazing photos of North American birds. Stokes’ Beginners Guide to Birds: Eastern Region – Another guide filled with tips and tricks on observing and protecting birds, but organized by color! Not sure what that yellow bird was? Flip to the yellow section for beautiful, up close photos. Sibley Backyard Birding Flashcards – David Sibley is a world-renowned ornithologist (aka bird expert!) and has created some wonderful materials for all types of birders. His flashcards are easy to use and beautiful. Attach them to a metal ring and bring them with for a quick reference. Merlin Bird ID – This free app from the Cornell Lab of Ornithology is perfect for little birders. Simply identify the size of the bird, main colors, and current behavior… then POP! You have a list of possibilities. The colorful, close up photos provided will help you narrow down your findings. So you have all your birding materials and you and your little one are ready to go. Now what? Simply head outdoors and see what you can see (or hear!). Plan a picnic or head to your neighborhood park. As you travel, keep your eyes peeled and your ears open. Birds are all around us! Below you’ll find some common birds found in Chicago – can you spot them in their natural habitats? 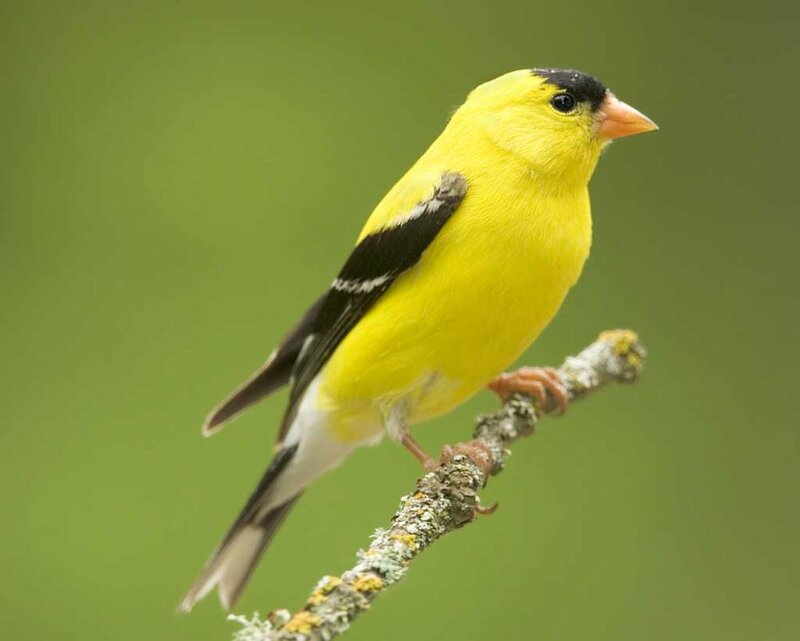 The male American Goldfinch is known for its bright yellow feathers. Look for yellow during April to September, when males are looking for a mate. Listen for a sharp "per-chick-o-ree" sound. The Blue Jay is one of the loudest and most colorful birds you'll spot! Listen for a "jay! jay!" call and a more musical "twee-dee." The Downy Woodpecker is the smallest woodpecker in North America. Males and females have black and white feathers, but only males have a red tuft on their head. Listen for the sound of their bills drilling into tree bark! A fun and easy-to-recognize bird, the Northern Cardinal is the state bird of Illinois! Males are known for their striking red feathers. Listen for "what-cheer, cheer, cheer," "purty-purty-purty-purty," or "sweet-sweet-sweet-sweet." Red-Tailed Hawks are the most widespread and familiar large hawks in North America. Look for the trademark reddish-brown tail. Listen for high-pitched, raspy screams. 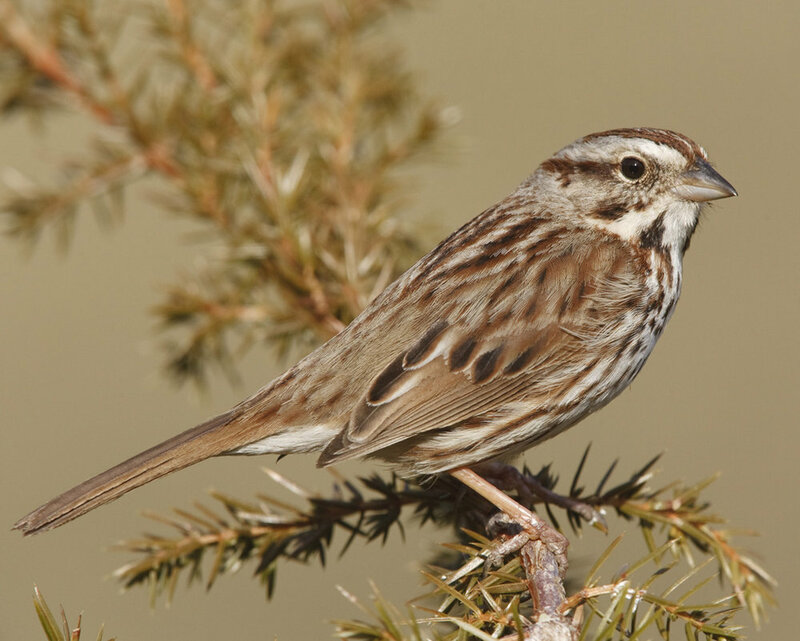 The Song Sparrow is one of the most familiar birds in our area. Tiny and speckled brown, these sparrows are known for their beautiful songs, starting with 3 identical, short notes followed by a trill.